For a long time I have considered myself an introspective person, and I have attributed what wisdom I posses to this attribute. Others have noted before me that the self is the greatest opportunity to understand the social world and its behaviours for the reason that the self is always around to be observed. In fact of all people, we cannot escape only ourselves. Of course any scientific observation of an n = 1 sample group may be questioned – but we can escape this paradox if we apply experiment on what we have discovered through introspection to others in our world. Social experimentation. Interaction with people as a way to prove hypotheses of human behaviour theory. I have been considering self-control and the role and extent of autocracy of the personal will on one’s own behaviour. 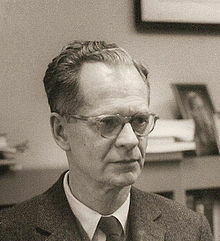 As such I began looking for research material on the subject, which lead me to BF Skinner and the work I will start to summarise and perform exegesis upon below. Now some thoughts on the book itself. Chapter one has some interesting ideas. It begins with the question “Can science help?” and goes on to elucidate on the goods and bads of the scientific era (these past few hundred years) in which there has been an exponential increase in scientific discovery. Skinner’s position is that natural science has developed so fast as to leave the science of human nature behind – thus causing imbalance in our world. Humanity develops its understanding of technologies which have major effect on our social world and it discovers and defines laws and relationships in the natural world by which we can predict the effects of natural processes (enabling such things as atomic bombs and aeroplanes through nuclear fusion and fluid mechanics in aeronautics) but we do not apply the same drive and energy into discovering and defining the laws and relationships in the world of human nature with which we could predict the outcomes of our scientific creations (such as Hiroshima, 9/11, etc). Skinner goes on to argue against those who rebel against the idea that human behaviour can in fact be understood through defined laws and relationships. On a side-note, it amazes me that the world has come so far and yet our common understanding of human nature is still mostly agnostic. We all agree on principles such as gravity but we don’t all share agreement on what motivates human decisions. The question still remains however, is human nature subject to behavioural theory and prediction? What percentage of human behaviour is a categorical response to external stimuli and what percentage is not? Experiments like Skinner’s box and Pavlov’s bell suggest some relationship. Skinner’s next chapter begins to dig into this “Science of Behaviour” as he tries to show the extent to which the study of people’s actions are subject to the same methodology as is used in the hard sciences. I aim to determine from his theories the relationships between and key principles behind free will and self-control. This post is a follow up to my last post on depression about a month ago. I felt that neither was it complete nor was it an satisfactorily accurate reflection of my thoughts. I realised that discussion or conversation may be the best arena for the topic rather than singular treatises. So accordingly, this post includes a guest appearance by my good friend TUE over at theurbaneagle.wordpress.com. We have both battled bouts of depression at times and have both given a crack at understanding it. TUE first posted about it here in depression and faith part one. TUE’s post is well written and I recommend reading it. The conversation below is transcribed from the comments in my previous post (you may want to read said post if you haven’t already though it’s not essential). I will update it as and when the conversation continues. I think there is complexity in this subject that will dip into the nature of sin, the nature of the promises of God, the interpretation of Biblical suffering and the understanding of the intersection between body and soul. For example, suffering is known to not always be the result of sin (, but suffering/stress increases cortisol which over time makes one feel depressed via direct action on the brain. People who commit suicide have real, observable anatomical changes related to hormone and brain function from depression. One can then ask the question at what stage does the spiralling levels of cerebral serotonin become medical depression, and furthermore whether treating it is then a spiritual or biochemical issue. This needs to be raised because then treating depression with antidepressants is sin. And if it is not sin, does that mean that there is a true medical adjuvant to grace? This is a difficult topic for many people. For example, can people post head injury be Christian? Does this mean that the linked aggression and depression issues are sinful? Or is it linked to suffering for God’s glory? What about severe hypothyroidism or diseases of excess cortisol? There must clearly be a holistic model that first clearly defines aetiology, as in underlying cause. And sin must be included true. But in that should there be complexities linked to godly suffering and the normal physiological response, and also the role of the abnormal physiological system causing depression isolated from the above aetiology. As far as I see it, if you link the factors you would find that some depression is medical, but can be exarcerbated by a sinful response. Some suffering of godly origin can be exacerbated by a sinful response. Some suffering for one’s good will cause a natural physiological response akin to depression that forever molds one’s brain and experiences into becoming who God wants you to be. And like you mentioned, some depression is of a direct result of the sinful nature. This same process can obviously be dealt with in a sinful manner by the believer. There is overlap and I think valuable nuances? You must be commended for tackling such a loaded, candid and complex topic. These are just thoughts from a fellow traveller and thinker. Ok, let’s see. It’s taken me a month to distance myself from the topic so as to come back and respond to your comments. They are very good comments. I must try to clarify one thing: I believe that it is sinful to live in depression, but depression most certainly is not a punitive result of sin. This is a complex but imperative distinction. What I mean is that all depressions are a result of the attribute of sinfulness belonging to this messed up world (think: death, violence, crime, etc. ), but they are not a punishment from on high. My best friend dies in a car accident and in the mourning I fall into a deep and dark depression. My best friend’s sister mourns and is desperately sad, but never falls into a lasting depression. It appears to me then that I am mentally less healthy than the sister. Why am I less mentally healthy and more prone to depression? Any number of reasons including my biology, past experiences of evil, my own masochism. Whatever the case – there is some ownership that I must take in my condition. Even if it is biology – it is *my biology. What I am saying then is that the first step to recovery is taking responsibility even for the failures and weaknesses that are not directly my fault. This is complicated and I continue to wage war against my inability to express it properly. Anti-depressants could never substitute grace, and grace couldn’t substitute anti-depressants either… Grace is not the mechanism of healing, it is simply an avenue to psychological peace, a peace that may result in seeking out a psychotherapist and medication such as anti-depressants. Grace does not heal it provides freedom to be what you be, even be you depressed. Grace didn’t heal me. It gave me peace enough to look into what I needed to change in my perceptions and world to achieve joy again. Head injury people and other disorders/diseases should be looked at in the same way. What grace does for all of these people is say to them (even if they don’t understand it) that despite their condition (which is a result of a broken world) it is ok and they are accepted for who and what they are anyways. Medical care does this intrinsically when the doctor doesn’t blame the person or look down on them but accepts them as what they are (definitive grace) and offers them the mechanism for healing. I won’t respond to the rest of your comment just yet because I believe I have shifted what you will understand to be my standpoint. Please respond accordingly with the same or new comments. Thank you for the detailed answers. It is a loaded and incredibly deep topic. One that is also impossible to separate from personal experience. When I tried, I found myself too ignorant of the depths of the biology, psychology and theology which intertwines and somewhere snakes its way through highest truth’s treacle. Can’t add much to this brother, your thoughts continue to be valuable to me and I’m sure to others.